Hypothetical "Terra Australis" in a map by Cornelius Wytfliet from 1597. 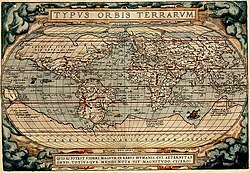 Terra Australis occupies a large part of the southern hemisphere in this world map of 1587 by Rumold Mercator. ^ "The Spanish quest for Terra Australis". State Library of New South Wales. Retrieved 13 May 2018.